Here is a picture of my basic macro bench rig. It's home made from adapted parts at minimal cost. 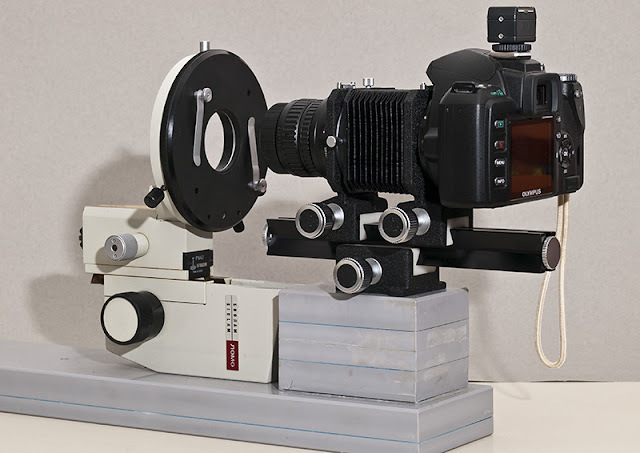 To the left is the adjustment mechanism from a microscope and this allows movement of the subject in two micrometer steps. The circular stage can be removed and other sample holding means used (when I get around to making them!). To the right is a Pentax M42 bellows unit with an Olympus E-510 attached. The lens is a Nikon 50mm enlarger lens which provides a magnification of x5, depending on the extension of the bellows. Next time I set up the whole unit I will post a picture.